Okay, not a massive deal, but it made me smile. This was pretty much the only reason I needed to install Chrome on any of my PCs, and that reason no longer exists. Do I love Internet Explorer? Most of the time. It does some things badly, but now covers all my usage scenarios, is fast, and comes pre-installed every time I wipe and refresh my machines (which can happen relatively often depending on how much beta software I’m playing with at the time). That, and it has slowly been getting a lot better. I’ve also been pretty annoyed with the recent Chrome updates too. I hate the fact that they took away something I relied on a lot – the recently closed tabs feature. And yes … I’ve tried that while logged in to Chrome too. Lots of people complaining about it on the Inter-tubes. Oh, and it’s right there on a new tab in IE. 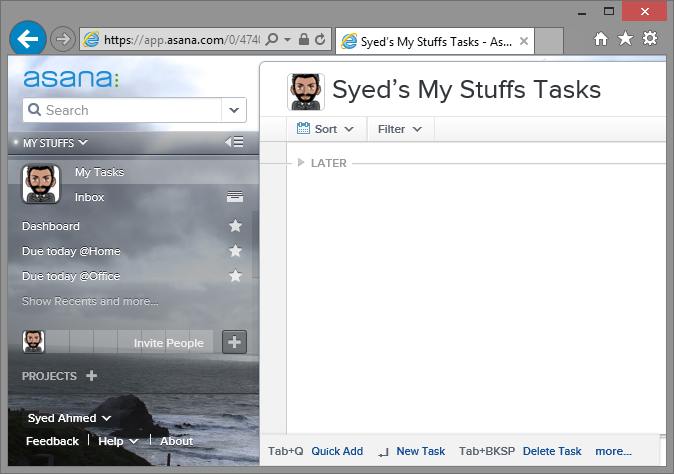 In any case, this isn’t a browser comparison post, but rather one about Asana. Definitely one of the better personal and team task management tools out there. I migrated to it a few months ago as part of my GTD trusted system, and while it wasn’t quite feature-rich and integrate-able (not a real word) for adoption by my teams for work purposes, a number of people have also started using it personally. Asana provides free access for teams of up to 15 members, and most of the useful features are included in the free version. If your personal or team task / project management needs aren’t overly complicated, they are certainly worth a look. Full disclosure: I have no personal / professional affiliation with Asana except as a user. I get no benefit from recommending them, except a warm and fuzzy feeling of sharing a system that has worked for me.